At the center of God’s story stands this singular act: In Jesus Christ, God personally intersected human history and redeemed humanity at a particular time in a particular place. Yet this central act of redemption does not stand alone. It is bordered by God’s good creation and humanity’s fall into sin on the one hand and by the consummation of God’s kingdom on the other. This story of (1) creation, (2) fall and law, (3) redemption, and (4) consummation is the story that Christians have repeated to one another and to the world ever since Jesus ascended and sent his Spirit to dwell in his first followers’ lives. This age-old plot-line should frame every aspect of our lives—including our ministries to families. Seen from the perspective of this fourfold storyline, here’s what becomes clear about family, family ministries, and diversity: From the beginning, the family has been a God-ordained means for the fulfillment of God’s purposes, but God’s plan for the family has always been to reach beyond the family to form a diverse community. Creation: Before the fall, God formed the human family so that images of himself would be multiplied throughout the cosmos (Genesis 1:28). Family and duality of gender do not constitute the essence of creation in God’s image, but they were God’s ordained means for the multiplication of his image. Fall: After the fall, the human family remained part of God’s plan and became a means by which God would bring a Savior into the world (Genesis 3:15). Redemption: After the redemption of the cosmos in Christ, it became clear that human families are both a means for training children in Christ’s ways (Ephesians 6:4) and a sign that points to a greater family, the community of those united with Christ (Ephesians 5:27-33). Consummation: The human family provides a vital context for the discipleship of children in the present. The human family is not, however, eternal (Matthew 12:50; 22:30). Human families are a temporary context that point to a greater, eternal communion. The human family as a means of discipleship points to a dynamic that I have termed family-as-church. The goal of this dynamic is to equip parents to disciple their children in the context of their daily lives together. What this means practically is that Christian households begin to function as living microcosms of the larger community of faith, with families learning and living the gospel together. The assumption that believing parents should train their children in God’s precepts is woven throughout the pages of Scripture (see, for example, Exodus 12:25–28; Deuteronomy 6:6-7; 11:1–12; Psalm 78:1-7; Ephesians 6:4). The human family as a sign that points to a greater family points our attention to the dynamic that I have termed church-as-family—the truth that the church is to function as a greater family that radically relativizes all other allegiances and identities. It is the dynamic of church-as-family that is most vital when it comes to intergenerational ministry. The dynamic of church-as-family declares that my earthly family is not enough and that—if I am a follower of Jesus Christ—the primary purpose of my earthly family is to function as a signpost pointing to my first family, fellow believers in Christ. Inasmuch as I am united with Jesus Christ and adopted in him, my first family includes anyone who does the will of our Father in heaven (Mark 3:35). The goal of church-as-family is to enable God’s people to relate to one another more like a family, recognizing that the family of God constitutes a new humanity in Christ (Ephesians 2:15). One aspect of what this means in practice is that the church is called to pursue ethnic, cultural, and socioeconomic diversity. It also means that we are called to nurture one another within a rich matrix of intergenerational relationships. To be a disciple is to live as an apprentice who participates in life with his master and who patterns his life after the life of his master. In the first century, a disciple’s relationship with his master was never merely intellectual; it was also relational and participatory. Discipleship was associative and mimetic in nature; that is to say, the disciple imitated and was associated with the master and, in this way, the life of the master was, in some sense, imprinted and replicated in the life of the disciple. “Discipleship” in the Christian sense describes personal participation in the life of the Triune God among the people of God in union with Christ, resulting in growth in the knowledge of God’s Word and in the imitation of God’s way through the power of God’s Spirit. The church is the sphere of discipleship, and the spiritual disciplines are a primary means of discipleship. So what do discipleship and spiritual disciplines have to do with intergenerational ministry? Quite a lot, as it turns out! When I first became a Christian, about fourteen years ago, I thought that I could do it on my own, by retiring to my rooms and reading theology, and I wouldn’t go to the churches and Gospel Halls; … I disliked very much their hymns, which I considered to be fifth-rate poems set to sixth-rate music. But as I went on I saw the great merit of it. I came up against different people of quite different outlooks and different education, and then gradually my conceit just began peeling off. I realized that the hymns (which were just sixth-rate music) were, nevertheless, being sung with devotion and benefit by an old saint in elastic-side boots in the opposite pew, and then you realize that you aren’t fit to clean those boots. It gets you out of your solitary conceit. One aspect of the church’s witness to the world is that those who rub shoulders in the shadow of the cross should be precisely the people that the world would never dream of mingling together. The nations and the generations need one another in the church because this diversity elicits praise in response to the polychromatic and multigenerational gathering that God the Father has gathered through the sacrifice of his Son. In John’s apocalyptic vision, the eschatological diversity of God’s people results in an angelic song of praise (Revelation 7:9-12). Diversity in the church was never intended, however, to be an abstract concept, true at the level of the universal church but not in local assemblies in the present time. When Jesus called his first followers, he assembled a band of Jewish males following a Jewish male—but he refused to allow his disciples to remain a homogeneous group. He led them into the presence of Syrophoenician and Samaritan women (Mark 7:24-26; John 4:9, 27) and expanded his circle of disciples to include both men and women (Matthew 27:55; Mark 15:41; Luke 23:49). Then, moments before he left the planet until a second coming that is yet to come, Jesus commissioned his disciples to proclaim his truth among the Gentile nations and to participate with these nations in the life of the Triune God (Matthew 28:19-20; Acts 1:8). This commission set the first disciples of Jesus on a trajectory that placed them first among Jews outside Judea and Galilee, then among Samaritans, and eventually in the midst of assemblies of men and women from every nation of the Roman Empire and beyond (Acts 2; 6; 8-10). Seen from this perspective, intergenerational ministry isn’t simply another church program or a solution to a perceived problem. 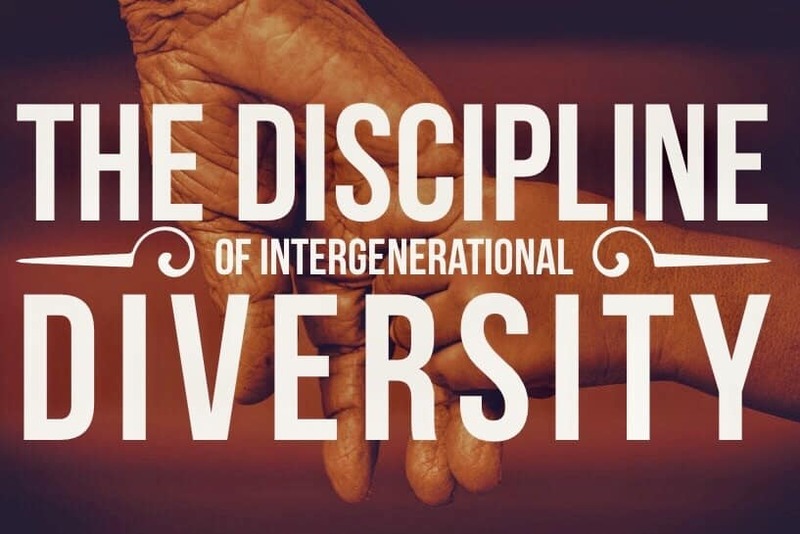 Intergenerational ministry is, at its best, the practice of the discipline of diversity through the formation of discipling relationships that transcend generational barriers. Healthy discipleship in the church is dependent on the practice of the discipline of diversity. Practically, this reconciliation of diverse persons in Christ means not only that we will coexist with people who are different from us but also that we will suffer with them. There is no unity in diversity until we enter into one another’s pain. Christians have been divinely called to practice the spiritual discipline of diversity in discipleship—and this diversity should be not only ethnic or socioeconomic but also generational. Despite the clear importance of the discipline of diversity, a majority of teenagers in churches today have not developed deep relationships with older believers. According to sociologist Christian Smith, nearly forty percent of churched American teenagers have no adult in their churches to whom they might turn in times of distress; another twenty-seven percent have only one or two such adults. This isn’t because young people are unwilling to interact with adults in their churches. Nearly eighty percent of churched youth enjoy conversing with adults in their church communities. Among youth who do not know any adults in their churches with whom they might converse, sixty-one percent wish that they did. Students are open to building connections with the men and women who are likely to remain rooted in their churches long after students scatter into colleges and careers. But how can we best pursue this discipline at the level of local churches? In particular, how can we practice the discipline of diversity without cluttering our church calendars with too many activities? What I will develop and present in the second post in this series is a practical model for engaging in the discipline of age-diversity at the level of the local church. Click here for the second part of this two-part series. Which of these two dynamics does your church do most effectively—church-as-family or family-as-church? What could you do this month in your church to strengthen the dynamic of church-as-family, particularly when it comes to relationships between older adults and youth?